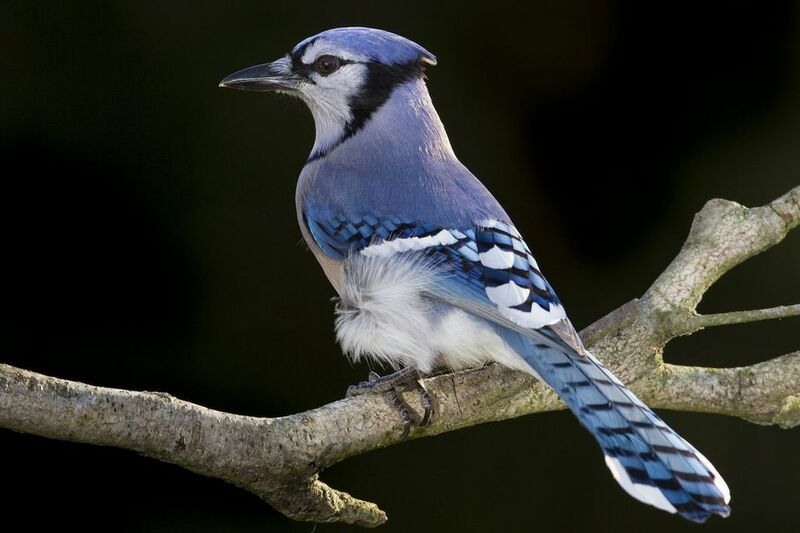 The blue jay, with its bold coloration and even bolder personality, is one of the most common and familiar backyard birds in the eastern United States. Its intelligence and willingness to visit feeders make this member of the Corvidae bird family a welcome guest for many birders, and it's easy to find blue jays in your yard. This fact sheet will not only introduce you to blue jays, but help you learn more about their unique personalities and how to entice them to visit your yard. These corvids are easy to identify by their color and markings, but looking a bit more closely at their physical structure can help birders learn even more about blue jays. These birds have a thick, black, stout bill, and the head features a prominent crest that can be raised or lowered with the bird's emotions and agitation. Male and female blue jays look alike with a white face, throat, and chin bordered by a prominent black necklace that extends from the nape to the breast. A thin back eye stripe marks the face. The head, crest, and back are bluish purple, while the wings and tail are a bright blue with white spots and distinct black bars. The chest, abdomen, and undertail coverts are white or grayish-white, and the legs and feet are black. The eyes are dark brown-black. Juveniles are similar to adults, but have less distinct markings, particularly on the face and head. The crest and tail are noticeably shorter on young birds, and the plumage in the upper body is often more grayish and fluffier than on adult birds. During the seasonal molt, blue jays may go temporarily bald, losing all the feathers on their heads and necks, showing the gray-black skin underneath. This can be startling but is a natural part of the molt cycle. Within a few weeks, all the head and facial feathers will regrow. Blue jays are loud and noisy, though they are uncharacteristically quiet during the nesting season (May-July). Their calls include loud, strident “do-it” or “jaaaay” sounds as well as warbling chirps. Some birds have been heard to imitate hawk calls. Most vocalizations are used to intimidate or threaten other birds or intruders near nesting or feeding areas. Blue jays are common throughout the eastern and central United States and southern Canada from the Atlantic coast to the Rocky Mountains and eastern Texas. These birds are highly adaptable to different habitats and can be found in different types of forests as well as cities, parks, and suburban areas where mature trees are present. While extreme northern blue jay populations may migrate seasonally, particularly during harsh winters, most of these birds remain in the same areas year-round. These birds are frequently found in pairs or family flocks and they are very protective of their nests, even to the point of diving at intruders, including humans. Another threat display includes raising the head crest very prominently, typically accompanied by raucous calls or even forward lunges. They are inquisitive and intelligent birds that hide nuts and seeds for later feeding. Food they don't return to consume often sprouts to become additional habitat for future generations. At feeders, these jays can be bullies and may quickly rob feeders of select treats. To minimize that behavior, birders might use dedicated peanut feeders or opt for some smaller feeders jays cannot use to be sure other species can feed without interference. Blue jays are omnivorous birds and opportunistic feeders that may sample just about anything available. Nuts, berries, seeds, corn, carrion, insects, eggs, and even small animals such as lizards or baby birds may be part of their diet, and they easily switch to different food sources at different times of year. This adaptability serves blue jays well and allows them to occupy their range year-round as well as investigate habitats that may not be as suitable for species with more restrictive diets. Blue jays are monogamous birds and pair bonds may last through several nesting seasons. A mated pair will work together to build a cup-shaped nest using sticks and twigs, bark, moss, grass, and even artificial materials such as paper, string, or yard. The nest is positioned in a tree crotch or branch fork usually 5-20 feet above the ground, though higher nests have been recorded. Both male and female blue jays incubate the brood of 3-7 pale green-blue, darkly spotted eggs for 16-18 days. Both parents also feed and care for the nestlings for 18-20 days until the young birds are ready to leave the nest. Bird pairs may raise 1-3 broods per season depending on available food and regional climate, with multiple broods more common in the southern parts of their range. Even after they've left the nest, younger blue jays may stay in the same area as their parents until the next breeding season, when they will seek out their own mates and territories. These jays are not considered threatened or endangered in any way, and their adaptability serves them well for adjusting to new habitats or habitat changes. Outdoor and feral cats can be a threat in urban and suburban areas, however, and steps should be taken to protect backyard birds from cats at all times. Blue jays easily visit yards and gardens that feature suet, sunflower seeds, whole or shelled peanuts, bread scraps, and corn. With patience, birders may be able to hand-feed regular guests. Blue jays are also attracted to water and will frequently visit bird baths for drinking and bathing. Planting oak trees will also help provide a natural nut source to attract blue jays. Because they are widespread and adaptable, blue jays are not hard to find within their range. Watch for these birds at mid-level in trees, particularly where oak or other nut-producing trees are present, and listen for their strident calls. Blue jays will readily come to feeding areas, and many nature centers maintain feeders with seed, suet, and nuts that will easily attract blue jays and other local guests. Because these birds are lovely, distinctive, and intelligent, they are popular mascots for schools as well as sports teams. The most famous blue jay mascot is part of the Toronto Blue Jays baseball team, which adopted the bird as its official mascot in 1979. Despite some style and logo changes over the years, the blue jay remains the team's mascot to this day. Be sure to visit more of our detailed bird profiles to discover more about all your favorite species!